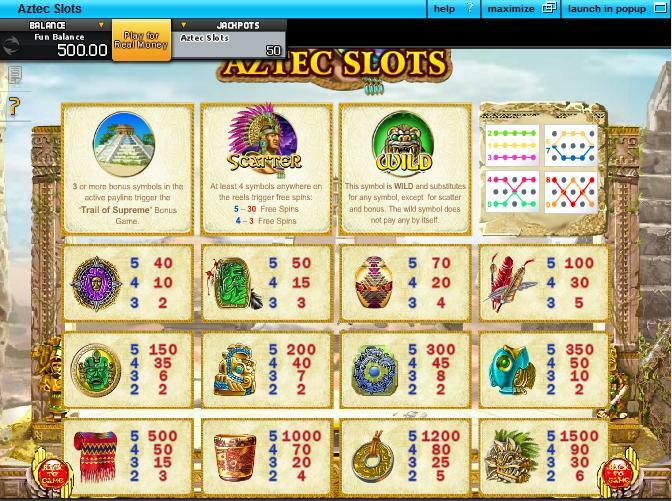 There are several Aztec themed slot machine games out there on the net. What makes GamesOS’ version stand out is that it hasn’t been designed in quite the same fashion as the others. Those slots contain highly colourful, if unauthentic imagery. 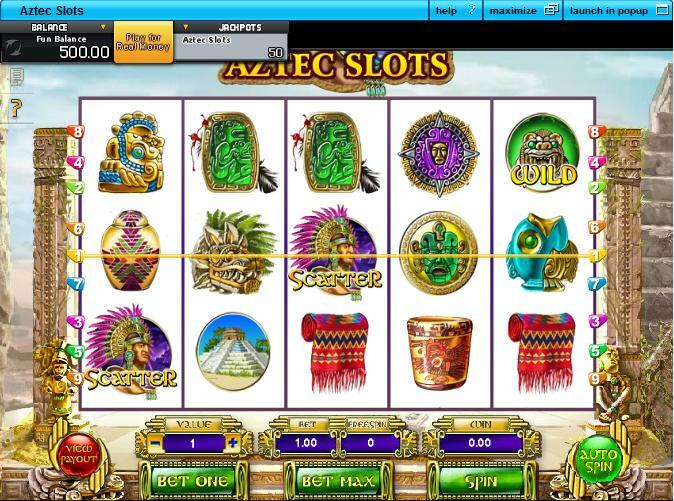 Aztec Slots tries to keep things real, and that is certainly going to make it more visually impressive to players who care about such things. 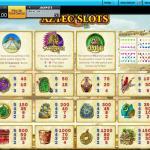 As for the slot, itself, this 5-reel, 9-line slot machine game is primitive. Newbies should be able to get the hang of it within seconds. At the same time, they will be able to select line bets of 0.10 per line, up to 5.00 per line. With all 9 lines being adjustable, players will be able to select wagers which range from a floor of 0.10 per line per spin, up to 45.00 per spin in all. 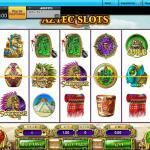 Players who strike it lucky with this slot machine game can win as much as 1,500 coins in total. To bag that prize, they need to line up 5 dragon-looking emblems on a line. The monkey looking stone emblem acts as a wild symbol in this slot machine game. Wild symbols can substitute for all other symbols in the slot, except for scatter and bonus icons. Wild symbols do not offer any cash prizes on their own. Players will find that scatter icons take the shape of an Aztec warrior. Landing 3 or 5 of these warrior symbols on the reels in any position will see players pocket a total of 3 free spins or 30 free spins. There is no middle ground with this slot’s free spins features – it really is all or nothing at all. A third type of special symbols can appear in this slot. Land the pyramid symbol three or more times on a payline and you will trigger the bonus. Keep in mind that this is not a scatter icon, so players must land them on paylines. Landing them across the reels in any spot simply won’t do. Once the Trail of Supreme bonus round has been triggered, players will be able to try and move their way along a labyrinth by choosing from several coloured symbols. Players need to try and survive for as long as they can in this mysterious – and seldom triggered – bonus round to bag sizeable, although not exaggeratedly so, cash prizes.